Today we are talking about arguably the most important pedal on your board, a tuner pedal! If the notes you are playing are out of tune your guitar is pretty much going to sound like crap no matter what you do. So what do you need? A magic pedal that mutes all the noise while you quickly get your guitar into a perfect harmonious tuning. A good guitar tuner pedal doesn’t create a lot of noise, is true bypass (no chance for loss of tone quality), responds well without being overly jumpy, and has a very bright display. It’s pointless to have a tuner pedal that you can’t see on stage or that creates a buzzing sound when it should be silent. Most guitarists will stick a tuner pedal at the very beginning of their pedal chain. This allows them to leave other pedals on while they tune and still get a pure guitar sound feeding into the tuner. However, other guitar players will put the tuner at the end of their pedal chain so they can quickly mute all sound and feedback at the end of a song. This approach may require you to turn off a few pedals while you tune. Now that we’ve covered the basics let’s dive in and find the best tuner pedal out there. The Boss TU3 Tuner Pedal has stood the test of time as one of the most durable and reliable tuner pedals on the market. It has appeared on countless professional pedalboards and still receives praise from guitarists and bassists alike. It features a high brightness mode for outdoor playing, support for drop tuning, and the classic and durable Boss stompbox style. The only thing it lacks is true bypass. This tuner is a great option for any player. The PolyTune takes a more modern approach to the tuner pedal. Since it’s release in 2010 the PolyTune has introduced a new polyphonic tuning method. The way it works is instead of picking each individual string to check it’s intonation, you can strum all the strings at once to get a quick glance of which strings need to be modified. This model uses a larger, bright LED screen to display tuning feedback and includes a Built-in all-analog Bonafide Buffer circuitry to preserve your tone when using a longer cable chain. This tuner pedal is incredibly fast and responsive with the Strobe Tuning option featuring .1 Cent accuracy. I don’t find myself using the polyphonic tuning feature of the PolyTune. However, this is still one of the best guitar tuners available and the price is still slightly less than classic tuners like the Boss TU3. The PolyTune 3 is a great option for people seeking a professional tuner that enables them to have a buffer and tuner in the first slot of their pedalboard. TC Electronics had already out done themselves with the PolyTune and then they made it smaller! Who wants to eat up all that room on their pedalboard for a simple tuner? 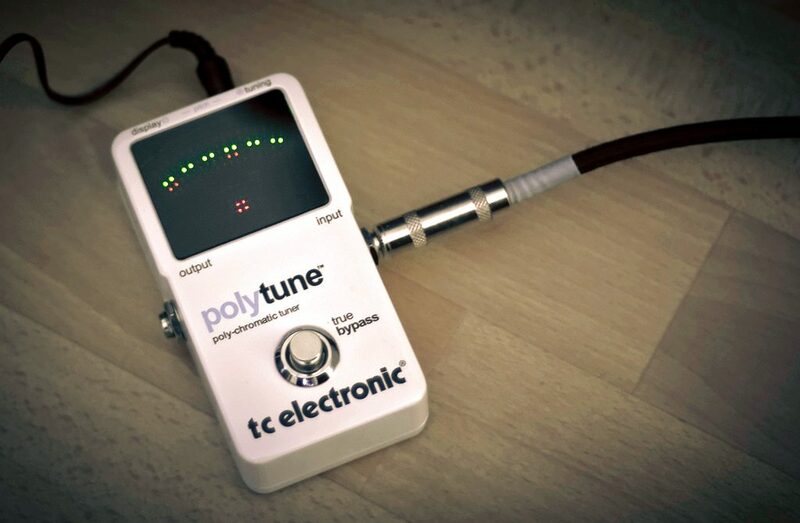 This tuner provides a smaller pedal footprint with all the important features of the PolyTune. It is very bright, responsive, and easy to use. Plus it also comes in a beautiful black and fancily named model they have labeled PolyTune Noir. This is the best tuner pedal out there and I think it’d make a great additional to any pedalboard. Thanks for reading and I hoped you enjoyed our list of the best tuner pedals for guitar. I hope these gear guides continue to be useful to the community. If you would recommend a tuner pedal that didn’t make the list drop us a comment and maybe we’ll consider adding it. Thanks y’all!